The System x3750 M4, machine type 8722, is a 4-socket server featuring a streamlined design, optimized for price and performance, with best-in-class flexibility and expandability. Models of the x3750 M4 are powered with Intel Xeon E5-4600 processors, up to 8 cores each, for an entry-level 4-socket solution. The x3750 M4 provides maximum storage density, with flexible PCI and 10 Gb Ethernet networking options in a 2U form factor. This product guide provides essential pre-sales information to understand the x3750 M4 server, its key features and specifications, components and options, and configuration guidelines. This guide is intended for technical specialists, sales specialists, sales engineers, IT architects, and other IT professionals who want to learn more about the x3750 M4 and consider its use in IT solutions. Withdrawn from marketing: The models covered in this product guide are now withdrawn from marketing. The replacement system is the Lenovo System x3750 M4 (8753) which is described in https://lenovopress.com/tips1252. The System x3750 M4 is a 4-socket server featuring a streamlined design, optimized for price and performance, with best-in-class flexibility and expandability. Models of the x3750 M4, machine type 8722, are powered with Intel Xeon E5-4600 processors, up to 8 cores each, for an entry-level 4-socket solution. The x3750 M4 provides maximum storage density, with flexible PCI and 10 Gb Ethernet networking options in a 2U form factor. Suggested uses: High performance computing (HPC), workloads with floating-point computations, and small to medium databases requiring fast I/O; applications that require 4-socket performance without needing the scalability that the eX5 systems provide. The x3750 M4 has outstanding memory performance that is achieved by supporting three-RDIMM-per-channel configurations at speeds up to 25% faster than the Intel specification, while still maintaining world-class reliability. LR-DIMM speeds are also 25% beyond the Intel specification for 1.35 V DIMMs, and this speed improve not only performance, but reduces overall system power at the same time. The x3750 M4 offers a flexible, scalable design and simple upgrade path to 16 hard-disk drives (HDDs) or 32 eXFlash solid-state drives (SSDs), with up to eight PCIe Gen 3 slots and up to 1.5 TB of memory. The flexible embedded Ethernet solution provides two standard Gigabit Ethernet ports onboard, along with a dedicated 10 GbE slot that allows for a choice of either two copper or two fiber optic connections. Comprehensive systems management tools with the next-generation Integrated Management Module II (IMM2) make it easy to deploy, integrate, service, and manage. The System x3750 M4 blends outstanding flexibility and expandability. The x3750 M4 2+2 socket design enables pay-as-you-grow processing with the new Intel Xeon E5-4600 series processors and memory scalability to help lower cost and manage growth. The 5+3 PCIe socket design allows you to pay for PCIe capabilities as needed. With the capability to support up to 48 DIMMs, four sockets, mix and match internal storage with up to 16 HDDs or 32 eXFlash SSD drives, 6 hot-swap dual rotor fans, two power supplies, and integrated 10 GbE networking with options for fiber or copper, the x3750 M4 provides unmatched features and capabilities in a dense 2U design. The Intel Xeon processor E5-4600 product family improves productivity by offering superior system performance with 8-core processors and up to 2.9 GHz core speeds, up to 20 MB of L3 cache, and up to two 8 GTps QPI interconnect links. The x3750 M4 2+2 processor socket design enables pay-as-you-grow processing with the Intel Xeon E5-4600 series processors and memory scalability to help lower cost and manage growth. Up to four processors, 32 cores, and 64 threads maximize the concurrent execution of multithreaded applications. Intel Advanced Vector Extensions (AVX) improve floating-point performance for compute-intensive technical and scientific applications compared to Intel Xeon 5600 series processors. The outstanding RDIMM memory performance of the x3750 M4 is achieved by supporting three DIMMs per channel configurations at speeds up to 25% faster than the Intel specification. 48 Load Reduced DIMMs (LRDIMMs) of 1333 MHz DDR3 ECC memory provide speed, high availability, and a memory capacity of up to 1.5 TB. The use of eXFlash solid-state drives (SSDs) instead of, or along with, traditional spinning drives (HDDs), can improve I/O performance. An SSD can support up to 100 times more I/O operations per second (IOPS) than a typical HDD. Up to 16 HDDs or 32 eXFlash SSDs, together with an optical drive at the same time, provide a flexible and scalable all-in-one platform to meet your increasing demands. The server offers a SAS switch backplane option (88Y7421) to allow up to 16 SFF devices to attach to a single controller. The server has two integrated Gigabit Ethernet ports and two optional 10 Gb Ethernet ports that do not consume PCIe slots. The 5+3 PCI Express socket design of the server allows you to pay for PCIe capabilities as needed. With Intel Integrated I/O Technology, the PCI Express 3.0 controller is integrated into the Intel Xeon processor E5 family. This integration reduces I/O latency and increases overall system performance. The server offers Chipkill, memory mirroring and memory rank sparing for redundancy in the event of a memory failure. The server provides restart recovery for any failed processor. In the event of a failure of processor 1, the server connects the southbridge to processor 2 for reboot. Tool-less cover removal provides easy access to upgrades and serviceable parts, such as the processor, memory, and adapter cards. The server has up to two redundant hot-swap power supplies and six hot-swap dual-rotor N+N redundant fans to provide availability for business-critical applications. The power source independent light path diagnostics panel and individual light path LEDs lead the technician to failed (or failing) components, which simplifies servicing, speeds up problem resolution, and helps improve system availability. The x3750 M4 provides error checking and/or Predictive Failure Analysis (PFA) on the following components. Alerts are generated in advance of a possible failure, therefore increasing uptime. The built-in Integrated Management Module Version II (IMM2) continuously monitors system parameters, triggers alerts, and performs recovery actions in case of failures to minimize downtime. Three-year customer-replaceable unit and on-site limited warranty, 9 x 5 next business day. Optional service upgrades are available. The server includes an Integrated Management Module II (IMM2) to monitor server availability and perform remote management. Remote presence support is standard. The integrated industry-standard Unified Extensible Firmware Interface (UEFI) enables improved setup, configuration, and updates, and simplifies error handling. IBM Systems Director is included for proactive systems management. It offers comprehensive systems management tools that increases uptime, reduces costs, and improves productivity through advanced server management capabilities. Highly efficient 750 W DC, 900 W AC, and 1400 W AC power supplies. 80 PLUS Platinum certification at high voltage AC. The Intel Xeon processor E5-4600 product family offers better performance over the previous generation while fitting into the same thermal design power (TDP) limits. Low-voltage 1.35 V DDR3 memory RDIMMs consume 19% less energy compared to 1.5 V DDR3 RDIMMs. Processor Up to four Intel Xeon processor E5-4600 product family processors, each with eight cores (up to 2.7 GHz), six cores (up to 2.9 GHz), or four cores (up to 2.0 GHz). Two processor sockets on the system board and two processors on the processor and memory expansion tray (standard on most models). Two QPI links up to 8.0 GTps each. Up to 1600 MHz memory speed. Up to 20 MB L3 cache per processor. Memory Up to 48 DIMM sockets (12 DIMMs per processor). RDIMMs and LRDIMMs (Load Reduced DIMMs) are supported, but memory types cannot be intermixed. The memory speed is up to 1600 MHz. There are 24 DIMM sockets on the system board. There are an additional 24 DIMM sockets on the processor and memory expansion tray (standard on most models). With LRDIMMs: Up to 1.5 TB with 48x 32 GB LRDIMMs and four processors. Disk drive bays Up to 16 2.5-inch hot-swap SAS/SATA bays or up to 32 1.8-inch hot-swap solid-state drive (SSD) eXFlash bays. Drive bays can be in any combination of four 2.5-inch drives or eight 1.8-inch eXFlash SSD drives. Maximum internal storage Up to 25.6 TB with 1.6 TB 2.5” SSDs, up to 19.2 TB with 1.2 TB 2.5" SAS HDDs, up to 16 TB with 1 TB 2.5" NL SAS/SATA HDDs. Intermix of SAS/SATA supported. RAID support RAID 0, 1, 10 with integrated ServeRAID M5110e with LSI SAS2208 6 Gbps RAID on Chip (ROC) controller. Optional upgrades to RAID 5 and 50 are available (zero-cache is 512 MB and battery-backed cache is 512 MB or 1 GB flash-backed cache). There is an optional upgrade to RAID 6 and 60 for a 512 MB or 1 GB cache. Optical drive bays There is one bay for an optional Multiburner drive. Tape drive bays None internal. Use a supported external tape drive. Network interfaces Emulex BE3 controller with two standard integrated Gigabit Ethernet 1000BASE-T ports (RJ-45) and two optional 10 Gb ports through an adapter in a dedicated slot. The 10 GbE options are 10Base-T dual port (copper) or SFP+ dual port (fiber). Slots 1, 2, and 3 are physically x16 slots. Ports Front: Two USB 2.0 and one DB-15 video on front. Rear: Two USB 2.0, one DB-15 video, one DB-9 serial, one RJ-45 systems management ports, two RJ-45 1 GbE network ports, two optional RJ-45 or SFP+ 10 GbE network ports. Internal: Two internal USB ports (for the embedded hypervisor). Cooling Calibrated Vectored Cooling with up to six N+N redundant hot swap fans (all six standard); each fan has two rotors. Power supply Up to two hot-swap redundant 1400 W AC power supplies (80 PLUS Platinum certification). 900 W AC and 750W DC power supplies also available through CTO or Special Bid. A second power supply requires that the processor expansion tray (88Y7365) or the power interposer card (88Y7367) be installed. Systems management UEFI, Integrated Management Module II (IMM2), Predictive Failure Analysis, Light Path Diagnostics, Automatic Server Restart, IBM Systems Director and Active Energy Manager, and the ServerGuide. Advanced Upgrade software feature for remote presence are standard with the x3750 M4. Operating systems supported Microsoft Windows Server 2008 R2 and 2008, Red Hat Enterprise Linux 5 and 6, SUSE Linux Enterprise Server 10 and 11, VMware ESX 4.1 and VMware ESXi 4.1 embedded hypervisor, and VMware vSphere 5. Service and support Optional service upgrades are available through warranty offerings: Four-hour or two-hour response time, eight-hour fix time, one-year or two-year warranty extension, remote technical support for hardware and some Lenovo and third-party applications. 1600 MHz M5110e 4x 2.5"
1333 MHz M5110e 4x 2.5"
1333 MHz M5110e 8x 1.8"
* All models except for 8722-A2x include the processor and memory expansion tray containing sockets for processors 3 and 4 and 24 DIMMs. For model A2x, order part number 88Y7365. ‡ Models C1x and C2x include the 1 GB Flash/RAID 5 Upgrade (part number 81Y4559) which is a 1 GB flash-backed cache with support for RAID 5. § Model D1x has two RAID controllers, D2x has four RAID controllers total. D1x and D2x include the 512 MB Cache/RAID 5 Upgrade (81Y4484), plus the Battery Kit (81Y4508), plus the SSD Performance Key (90Y4273) for each controller. Refer to the Standards specifications section for information about the standard features of the server. The x3750 M4 supports the processor options listed in the following table. The server supports up to four processors. Two processors are installed in sockets on the system board. Processors 3 and 4 are installed on the processor and memory expansion tray. Most models (with the exception of A2x, as listed in Table 2) have the expansion tray installed as standard. For model A2x, order part number 88Y7365 for the processor and memory expansion tray. The following table also shows which server models have each processor standard. If there is no corresponding where-used model for a particular processor, this processor is only available through CTO. Lenovo DDR3 memory is compatibility tested and tuned for optimal System x performance and throughput. Lenovo memory specifications are integrated into the light path diagnostics for immediate system performance feedback and optimum system uptime. From a service and support standpoint, Lenovo memory automatically assumes the system warranty. The System x3750 M4 supports DDR3 memory. The server supports up to 48 DIMMs when four processors are installed, with 12 DIMMs for each processor. 24 DIMM sockets (for processors 1 and 2) are located on the system board. The remaining DIMM sockets (for processors 3 and 4) are located on the processor and memory expansion tray. Each processor has four memory channels, and there are three DIMMs per channel. The x3750 M4 memory system has been carefully tuned so that the server supports higher memory frequencies than the Intel processor specification. You can, for example, use low-voltage DIMMs but still operate them at the rated speed. The following table lists the memory options that are available for the x3750 M4 server. The server supports RDIMMs and LRDIMMs. UDIMMs are not supported. Mixing 1.5 V and 1.35 V DIMMs in the same server is supported; in such a case, all DIMMs operate at 1.5 V.
The maximum number of ranks per one channel is eight (with the exception of Load Reduced DIMMs, where more than eight ranks are supported, because one quad-rank LRDIMM provides the same electrical load on a memory bus as a single-rank RDIMM). The maximum quantity of DIMMs that can be installed in the server depends on the number of processors installed. The table shows the maximum when all four processors are installed. When two processors are installed, the maximum quantity supported is a half of the quantity that is shown. Lowest of maximum operating speeds for selected memory configuration that depends on rated speed, operating voltage, and quantity of DIMMs per channel, as shown under "Max. operating speed" section in the table. The memory speeds highlighted in bold text indicate that the System x3750 M4 supports higher memory frequencies than the Intel processor specification. In some instances, this configuration also results larger memory capacity that the specification recommends. * Maximum quantity supported is shown for four processors installed. When two processors are installed, the maximum quantity supported is a half of the quantity that is shown. When one processor is installed, the quantity is one quarter of that shown. If memory mirroring is used, then DIMMs must be installed in pairs (minimum of one pair per CPU), and both DIMMs in a pair must be identical in type and size. The server can support up to 16x 2.5-inch drives, up to 32x 1.8-inch drives, or a combination of both 2.5-inch and 1.8-inch hot-swap drives, using the supported SAS/SATA backplane configurations. The server supports 2.5-inch hot-swap SAS or hot-swap SATA hard disk drives, 2.5-inch hot-swap SATA solid-state drives, or 1.8-inch hot-swap SATA solid-state drives. You can mix drives in the same server as long as you do not mix drives on the same array. 4-drive backplane for 2.5-inch drives: Up to four backplanes can be installed, each requiring one SAS connection to a supported controller. One RAID controller can connect to two of these backplanes. 8-drive backplane for 2.5-inch drives: Up to two backplanes can be installed, each requiring two SAS connections. One RAID controller per backplane. 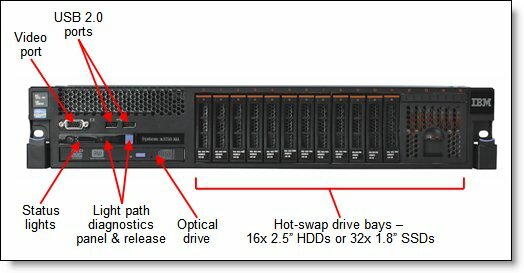 8-drive backplane with a SAS expander for 2.5-inch drives: Use in conjunction with the other 2.5-inch drive backplanes (8-drive or one 4-drive or two 4-drive backplanes) which will result in being able to connect up to 16 2.5-inch drive bays to the one RAID controller. 8-drive backplane for 1.8-inch solid-state drives (eXFlash Pack): Up to four backplanes can be installed, each requiring two SAS connections. One RAID controller per backplane. Cannot be connected to the 8-drive backplane with a SAS expander. When building drive backplane configurations, all 1.8-inch SSD drive backplanes must be installed to the right of all 2.5-inch HDD or 2.5-inch SSD drive backplanes (when looking at the front of the server). Every four drives uses a SAS signal cable except when the 8-drive backplane with SAS expander is used. 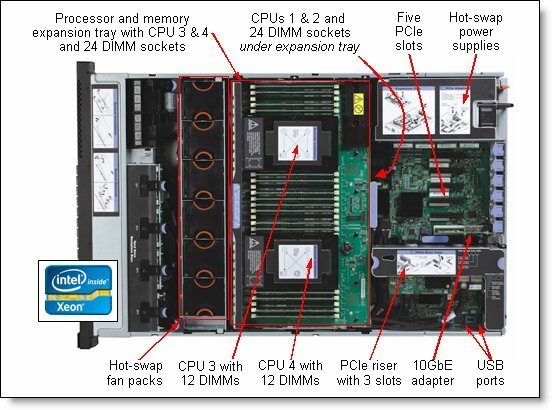 When the 8-drive backplane with SAS expander is used, the other backplanes connect to the SAS expander backplane with the supplied cables and then the SAS expander backplane is connected to the single RAID controller with two cables. All backplane options include the necessary cables. 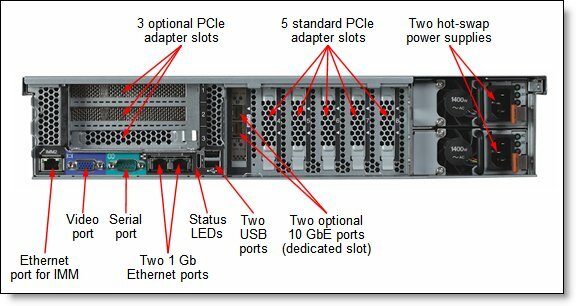 See the System x3750 M4 Installation and Service Guide for a description of all supported backplane combinations. Standard models (all models except A2x) ship with at least one backplane; see Table 2 for details. The following table shows the backplane options that are available for a x3750 M4 server. * When a server is ordered via CTO, only one 4-drive backplane can be selected. If the order has more than 4 drive bays, 8-drive backplanes will be selected instead. ** Only one backplane with SAS expander (88Y7421) can be installed in a server and can be used connected to a single 8-drive backplane (88Y7419), a single 4-drive backplane (88Y7418), or two 4-drive backplanes (88Y7418). The SAS expander backplane cannot be used with the eXFlash backplane. The following table lists the RAID controllers and SAS HBAs used for the internal disk storage of the x3750 M4 server. PCIe x8 2.0 host interface. Based on the LSI SAS2208 6 Gbps ROC controller. Supports RAID levels 0, 1, and 10. Supports RAID levels 5 and 50 with optional M5100 Series RAID 5 upgrades (see below). Supports RAID 6 and 60 with the optional M5100 Series RAID 6 Upgrade (see below). Supports 512 MB battery-backed cache or 512 MB or 1 GB flash-backed cache (see below). Note: The supported adapters for internal storage need to be installed in slots 1, 2 and 3 because of cable routing requirements. The x3750 M4 PCIe 3x8 riser (88Y7371) must be installed. These slots also require that Processor 2 be installed. The following table lists the optional upgrades supported with the ServeRAID controllers. * The ServeRAID M5100 Series Battery Kit (81Y4508) is only supported with ServeRAID M5100 Series 512 MB Cache/RAID 5 Upgrade (81Y4484). † The ServeRAID M5100 Series RAID 6 Upgrade (81Y4546) requires RAID 5 upgrades with cache (81Y4484, 81Y4487, or 81Y4559 only). ** Only one ServeRAID Feature on Demand upgrade is required per system, regardless of the number of adapters installed. The following table lists the hard disk drive options for the internal disk storage of the x3750 M4 server. The following table lists the ordering information for the riser card. x3750 M4 supports two integrated Gigabit Ethernet ports. Optionally, two 10 Gb Ethernet ports can be added by installing one of the available dual-port 10 Gb Ethernet cards listed in Table 12 (88Y7429 or 88Y7427). These cards use a dedicated connector on the system board and do not consume a PCI expansion slot. The onboard Emulex BE3 controller provides both the Gigabit Ethernet ports and the 10 Gb Ethernet ports. The optional cards are used route the ports to external RJ45 or SFP+ ports. Jumbo frames up to 9000 bytes. The following table lists the adapters that are supported in the dedicated networking slot. # Maximum quantity is achieved with processor 2 installed and the 3-slot riser card (88Y7371). With one processor, the maximum quantity is three (this maximum does not apply to the 10 Gb cards in the dedicated slot). The following table lists storage HBAs supported by x3750 M4 server. The maximum quantity is achieved with processor 2 and the 3-slot riser card (88Y7371) installed. With one processor, the maximum quantity is three (this configuration does not apply to the 10 Gb cards in the dedicated slot). # Maximum quantity is achieved with processor 2 and the 3-slot riser card (88Y7371) installed. With one processor, the maximum quantity is three. * The 6 Gb Performance Optimized HBA (46M0912) is for use only with internal disk storage and requires the x3750 M4 PCIe 3x8 riser (88Y7371) and a second processor to be installed. Note: The server supports a maximum quantity of three of the full-height adapters, which must be installed in slots 1, 2, and 3. These slots require the second processor and the 3-slot riser card, 88Y7371. The server supports up to two redundant power supplies. Standard models come with one or two 1400 W power supplies (model dependent; see Table 2). 900 W AC and 750 W DC power supplies also available through CTO or Special Bid. Installing a second power supply requires that the processor and memory expansion tray (88Y7365) or the power interposer card (88Y7367) be installed. The power interposer card option enables redundancy power support when the processor and memory expansion tray is not installed. If you do not have the processor and memory expansion tray installed and want to install two power supplies, then the power interposer card must be installed. * The power interposer is not needed if the processor and memory expansion tray (88Y7365) is installed. Each AC power supply ships standard with one 2.8 m C13 - C14 power cord. Two installed 1400 W power supplies form a redundant pair. Under extreme configurations, it may be possible to exceed 1400 W DC output. If this condition exists and a power supply fails, the server caps power at 1400 W until the second power supply is back online. The server contains Integrated Management Module II (IMM2), which provides advanced service-processor control, monitoring, and alerting functions. If an environmental condition exceeds a threshold or if a system component fails, the IMM2 lights LEDs to help you diagnose the problem, records the error in the event log, and alerts you to the problem. A virtual presence capability also comes standard in this server for remote server management.